Very simple with few ingredients but delivers terrific taste. A bit like cooked salsa or tomatillo sauce in texture. The acidity of green tomatoes is wonderfully balanced with sweetness coming from cooked onion. Added 1 garlic clove with the onion and instead of using cayenne I added urfa biber after coming out of the oven. Baked for 1 hour with aluminum foil at 400 F, but I felt that it needed more time to reduce the liquid so after 1 hr, took off the foil and baked for additional 30 min. Needs fair amount of of salt to bring out the flavor. Did not have ricotta salata and used dollops of ricotta cheese instead. Great for dipping bread or pita and fabulous with chilled white wine. Delicious--one of my favorite things to do with chickpeas. Great with a moroccan-style carrot salad. 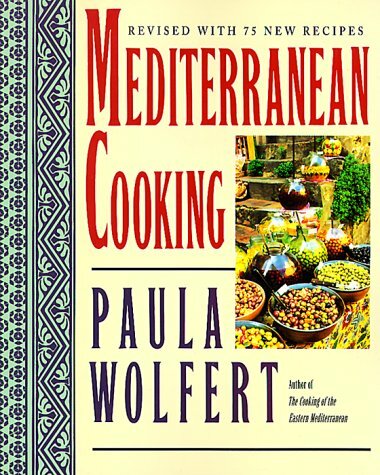 Renowned food writer Paula Wolfert revises her classic cookbook in which she celebrates the sensuous pleasures of health and popular Mediterranean cooking with more than 150 delicious dishes from this region, 75 of them new.